I spent last weekend in Ontario, mainly in Algonquin Provincial Park, about 3 hours north of Toronto. I first visited Algonquin in March 2013 primarily to look for Eastern Wolves. I wasn’t lucky then but had a couple of near misses so vowed to return. There is considerable debate on what an Eastern Wolf actually is. Some say its a northern form of the Red Wolf (Canis rufus), some say its a species in its own right (Canis lycaon) and others say it is a subspecies of Timber Wolf (Canis lupus). I won’t add to the confusion as I’m much less qualified to have an opinion than the bunch of experts who currently don’t agree with each other. But for the moment I will record it as a full species – C. lycaon – unless proven otherwise. Just because. The wikipedia page covers all this taxonomic angst in more detail. I arrived late Friday night. In 2013 I’d narrowly missed 2 wolves in the park so I began on Saturday morning by cruising the main road through the park at dawn. No mammals other than a couple of deer by my hotel at first light. Back at my hotel in Dwight (the super friendly Spring Lake Resort) my waitress told me that she saw wolves “all the time” and had had one in her back yard the night before after a kill. Back at the park visitor centre I chatted with David Legros, a wolf biologist, who confirmed that many of Algonquin’s wolves appeared to have decamped to Dwight, just west of the park, for the winter. This was probably because there were so many deer in the area: some of the Dwight locals feed the deer. In fact the park had put a road-killed Moose in front of the visitor centre 3 weeks before – usually a sure fire way to attract wolves – and nothing had touched it. He also let me know that a Marten had been seen around the bird feeder at the start of the Spruce Bog trail, across the road from the visitor centre. And sure enough it was there when I took a look. A gorgeous creature and a species I had seen only once before. 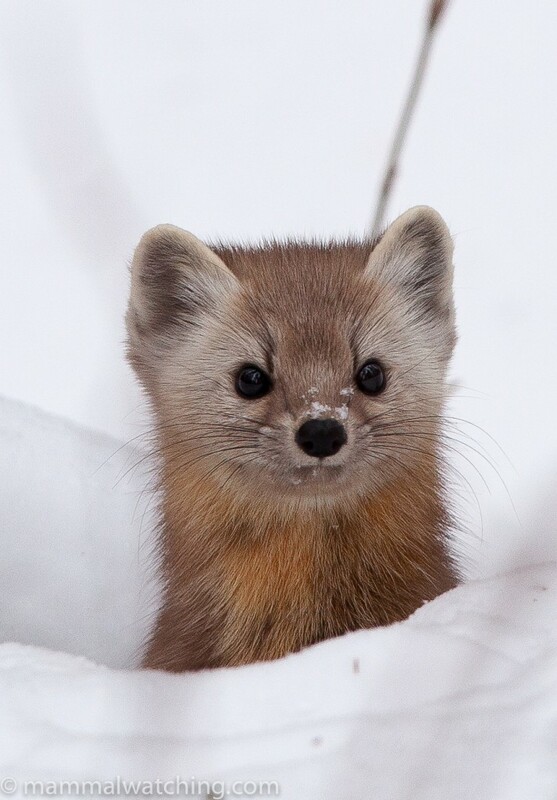 Martens seems relatively easy to see in Algonquin in the winter. Mew Lake is another reliable area for them. Fishers, however, are much more rarely seen. I spent Saturday evening cruising the roads around Dwight, particularly routes 12 & 8 – Livingstone Lake and Kawagama Lake Roads respectively – which branch north and east off of route 35, just north of the village of Dorset. After dark I tried to do some spotlighting until the bulb blew, though my fingers were about to drop off from frostbite by then in in any case. The only wild mammals were a few White-tailed Deer, though a pair of pet dogs caused a flurry of excitement. The next morning I was on the road an hour before sunrise and, just on sunrise, I spotted an Eastern Wolf running along a track off of Hwy 35, exactly 5 miles south of Route 60. I drove down the track and tried to get a picture but – as you can see – barely succeeded. And then the beast ran into the forest. 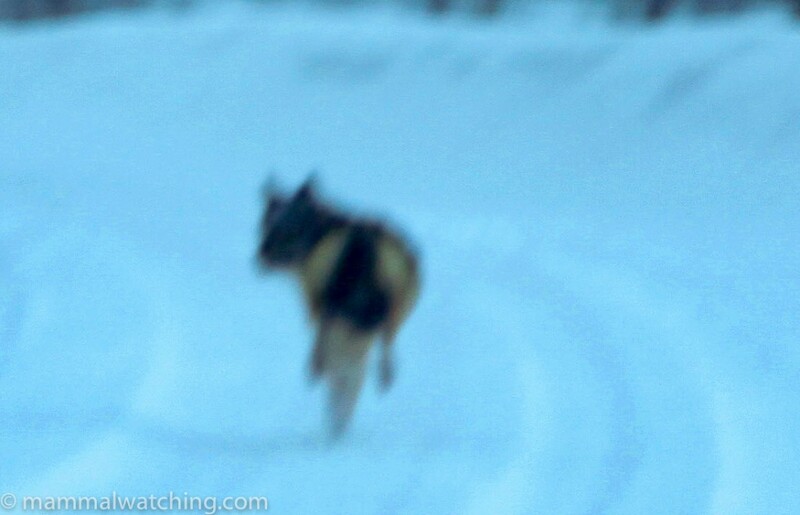 Eastern Wolf, Canis lycaon, at speed and taken through the windshield. I drove for another 2 hours or so and saw several sets of very fresh wolf tracks along the Livingstone Lake Road and may have glimpsed one more animal (may have .. by the time I had reversed the car to get a look whatever I had seen had gone). In Toronto on Sunday evening I met up with Sandy Gilliam, a friend of Fiona Reid’s, who was kind enough to take me to Luther Marsh Wildlife Management Area, near Wellington, Ontario, to show me exactly where her local naturalists’ society had seen Fisher tracks the week before. We snowshoed through the forest for a couple of hours at dusk. 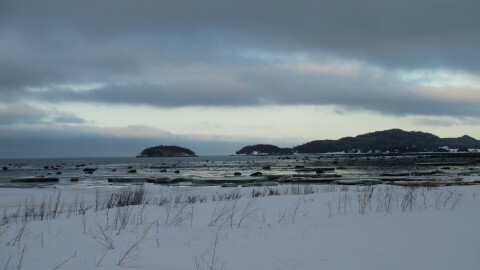 Lots of tracks – including many from Porcupines – but nothing that was obviously from a Fisher. The only mammal was a Porcupine on the road. Those things can move quickly when they need to! Anyone Going on the 9/30 Monterey Bay Whale Watch? It looks like fisher numbers are down at Algonquin. In February 2006 I was there for 3 hours and one of two mammals I saw was a fisher. Very interesting stuff, Jon. Another place to visit! I have been hearing that fisher trapping has been increasing due to overseas fur markets. This is anecdotal — I haven’t seen any papers on this. But I have been hearing from wildlife biologists and state game agency staff. I also know they are legally trapped in many areas, including reintroduced populations, so if pressure increases it could make a difficult-to-see mammal even more difficult.